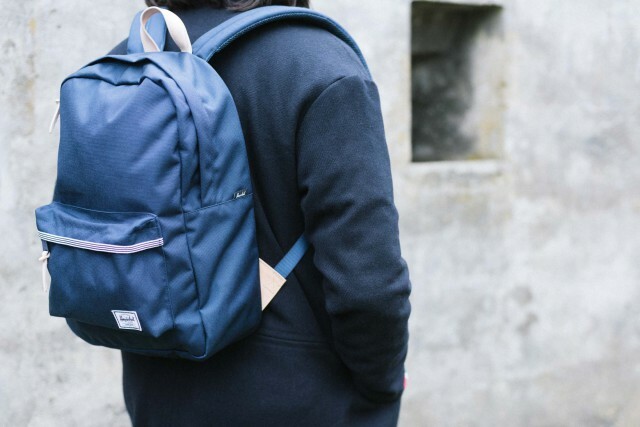 VANCOUVER, November 12, 2015 – Global accessories brand Herschel Supply presents the Cordura® Collection for Holiday 2015. Renowned for producing durable performance fabrics for over 45 years, lightweight Cordura® is applied to an exclusive backpack silhouette with premium finishes. Offered for the first time, the Winlaw backpack combines a timeless aesthetic with modern materials and utilitarian function. Subtly accented with polished metal hardware and rich vegetable tanned leather, this cleanly designed piece is protected by tear, scuff and abrasion resistant Cordura® Classic fabric. Available in Black or Navy, each silhouette is complemented by a striped grosgrain front pocket trim, with interior features that include a custom signature striped liner and leather-trimmed 13-inch laptop sleeve. Joined by a Cordura® branded tab, Herschel Supply’s classic woven label completes this resilient offering. The Herschel Supply Cordura® Collection for Holiday 2015 is available at global stockists and at herschelsupply.com.